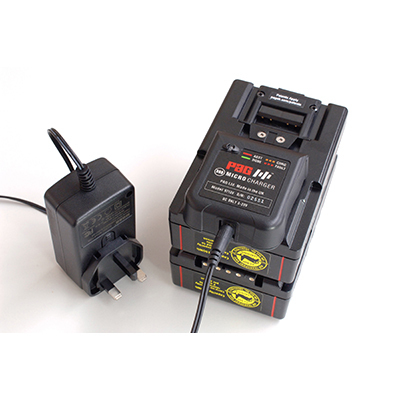 The PAGlink Micro Charger is ideal when you want to travel light and charge PAGlink V-Mount batteries. This ultra-compact, inexpensive charger and its accessories are small enough to fit in any camera bag. The charger accepts 5-20V DC input, and can be powered from a variety of sources, such as worldwide AC supplies (via its AC to DC adaptor), a 12V vehicle battery and even a USB charger. The accessories to achieve this are included, making the Micro Charger the ideal broadcast battery travel charging kit. 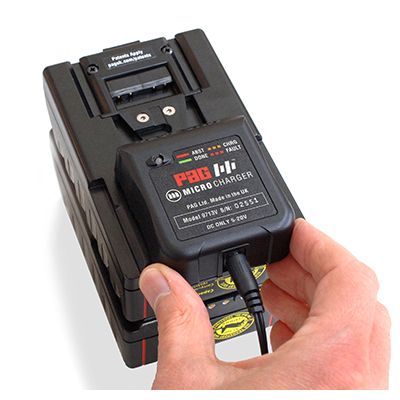 The Micro Charger will charge PAGlink V-Mount batteries of any rated capacity, and from any state of charge, individually or linked. 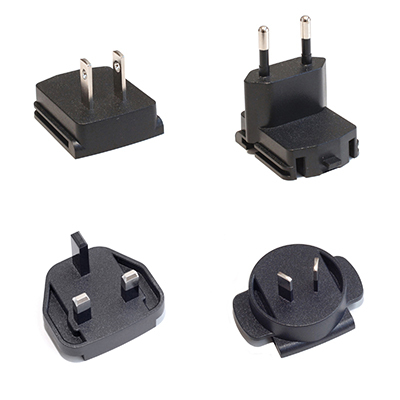 It can also be used for charging non-linking V-Mount Li-Ion batteries manufactured by PAG and Sony. 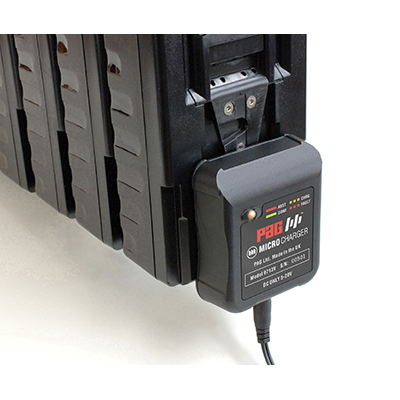 PAGlink is the first camera battery system that allows batteries to be linked for charging. At the end of a shoot, simply link your batteries and connect them to the charger. The next day, they will be fully charged and ready to go, without intervention. Two fully discharged 96Wh PAGlink batteries will be fully charged in 8 hours. The Micro Charger is designed for charging up to 4 PAGlink batteries. The charge status of each battery is shown on its individual display. The most-discharged batteries are given priority until all the batteries are in a similar state of charge; they are then fully-charged simultaneously. The charger features LED indication of charging, charge completion, absent battery and faulty battery. The charger can also be powered from a 12V vehicle battery, via the dashboard lighter socket, using the in-car DC power lead supplied. Charge times will be equivalent to those achieved when the charger is powered from an AC supply. 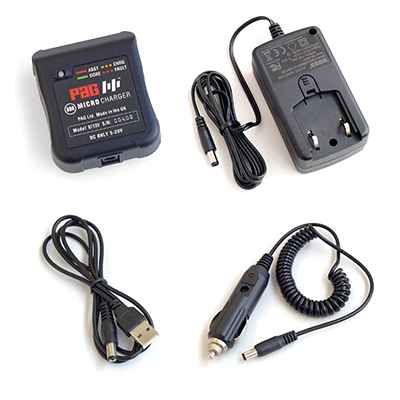 As a back-up option, the charger can be powered using a 2A USB wall-plug charger via the USB DC power lead included in this kit. The charge time will be approximately 10 hours for one 94Wh battery when using the USB option. Battery Connectors: 1 x V-Mount. Main Charge Program: Li-Ion voltage-charge program. Batteries can be in any state of charge. PAG recommends that this is limited to 4 fully-discharged 96Wh batteries if full-charging is required overnight (see Typical Battery Charge Times). The most-discharged batteries in the stack will be given priority. Automatically recovers a Li-Ion battery after shut down. 100-240V ~ autoselected. Frequency 50-60 Hz. Maximum power consumption 35W. Charger protected against short circuit and open circuit. Should AC power failure occur during a charging program, or whilst the charger is connected, it will shut down to a safe condition. LED indication is provided of battery absent, battery charging, charge completion and a faulty battery. The charger is fully automatic in operation and there are no user controls. 0ºC to 40ºC (+32ºF to +104ºF). Charging times given are for 96Wh PAGlink batteries, fully-discharged to fully-charged. 150Wh batteries will take 50% longer.